It's apple picking time! Now what to do with all those extra apples? We recommend this recipe, which uses a slow cooker to create a delicious treat combining walnuts and apples. First, core the apples. Then combine walnuts, currants, and brown sugar. Stir in the cinnamon. Put the apples in your slow cooker and spoon the mixture into the cavity of each apple. It's apple picking time! Now what to do with all those extra apples? 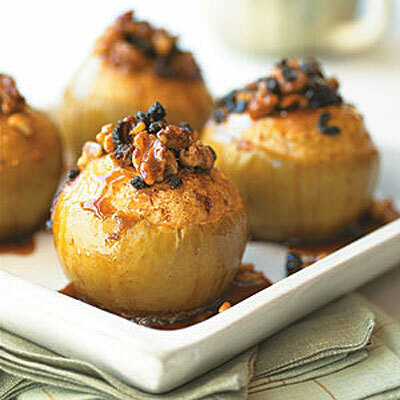 We recommend this recipe, which uses a slow cooker to create a delicious treat combining walnuts and apples. First, core the apples. Then combine walnuts, currants, and brown sugar. Stir in the cinnamon. Put the apples in your slow cooker and spoon the mixture into the cavity of each apple. Then combine the apple cider, brown sugar, and cinnamon, and pour over the apples. Cover and cook on low for 2 3/4 hours. Serve on their own or with low-fat frozen yogurt.